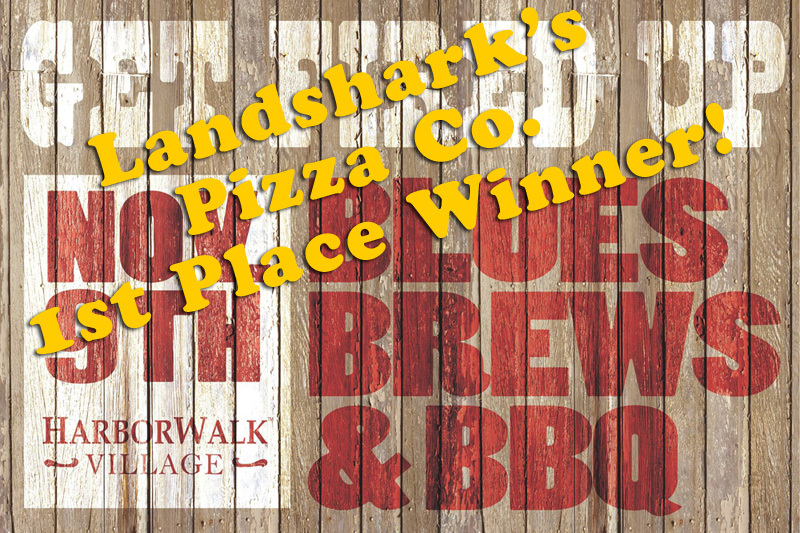 / Best Pizza In Destin Florida / See it Here – NASCAR CLASH AT DAYTONA & NBA ALL-STAR WEEKEND, COLLEGE HOOPS ALABAMA vs LSU plus TOP-RANKED #1, #2, #3, & #4 on tap! 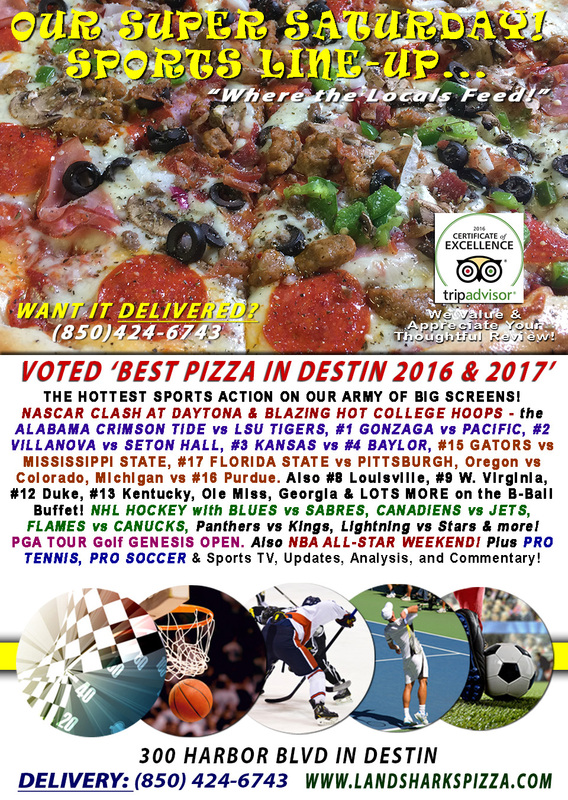 See it Here – NASCAR CLASH AT DAYTONA & NBA ALL-STAR WEEKEND, COLLEGE HOOPS ALABAMA vs LSU plus TOP-RANKED #1, #2, #3, & #4 on tap! 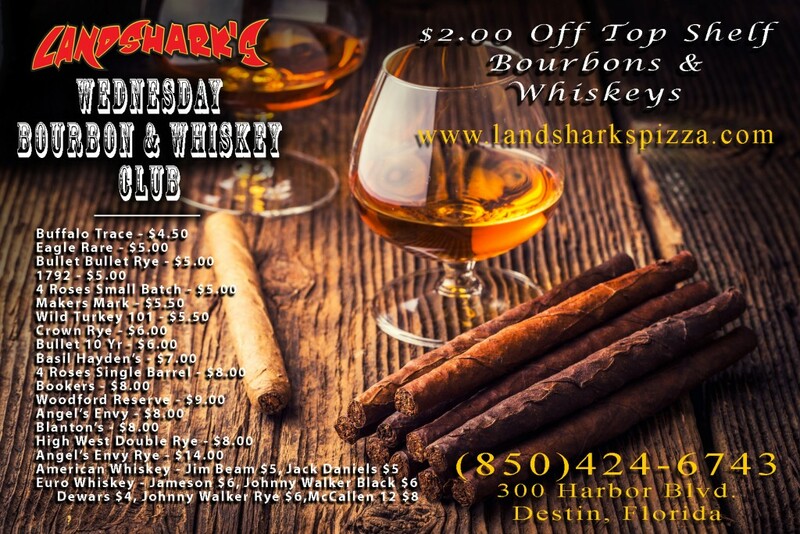 An INSANE amount of SPORTS ACTION in Destin at Landshark’s all day – NASCAR, NBA, NHL, NCAA, & PGA! 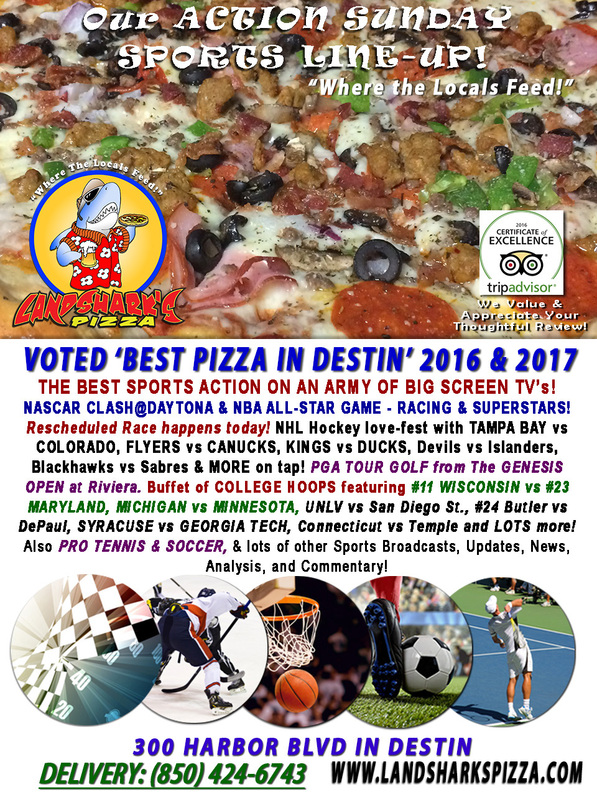 TODAY’S SPORTS ON OUR ARMY OF BIG SCREENS – NASCAR CLASH AT DAYTONA & Blazing Hot COLLEGE HOOPS CRIMSON TIDE vs AUBURN TIGERS, #1 GONZAGA vs PACIFIC, #2 VILLANOVA vs SETON HALL, #3 KANSAS vs #4 BAYLOR, #15 GATORS vs MISSISSIPPI STATE, #17 FLORIDA ST. vs PITTSBURGH, Oregon vs Colorado, Michigan vs #16 Purdue, plus #8 Lousiville, #9 W. Virginia, #12 Duke, #13 Kentucky, Ole Miss, Georgia & Arksansas on the B-Ball Buffet! PGA TOUR GOLF from the GENESIS OPEN. 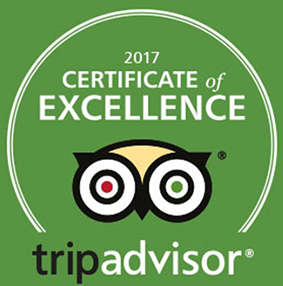 NHL HOCKEY action BLUES vs SABRES, CANADIENS vs JETS, FLAMES vs CANUCKS, Panthers vs Kings, Lightning vs Stars & MORE on tap! NBA ALL-STAR WEEKEND! Also, PRO TENNIS & PRO SOCCER plus plenty of other Sports Broadcasts, Sporting News, Analysis, and Commentary! NASCAR HAS LAUNCHED: THE CLASH AT DAYTONA Saturday February 18th. Duel #1 & #2 Thursday Feb 23rd; Camping World Trucks Friday Feb 24th, XFINITY Saturday the 25th, & Monster Energy Cup Daytona 500 Sunday February 26th! 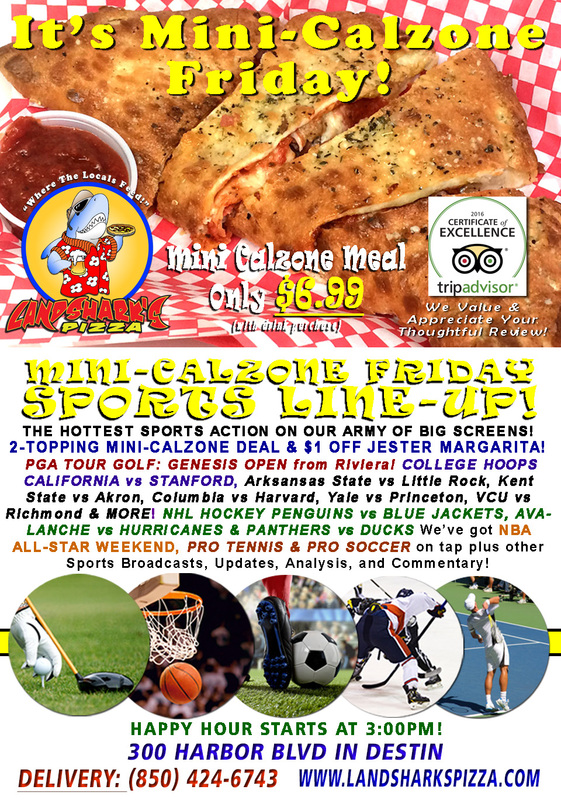 Previous Post: « FREEDOM FRIDAY Hot & Tasty 2-Topping Mini-Calzone $6.99 & NHL, College Hoops, PGA & NBA on Tap!